I saw it on the cooking show Extra Virgin of the husband and wife team of Gabriele Corcos and Debi Mazar. Pasta wrapped in eggplant slices then baked in a spring form pan. It reminded me of timpano albeit much simpler. While timpano uses pasta frolla crust to encase a bevy of fillings like meat and sausages in arabiata sauce, cheeses and eggs- this one is fried eggplant arranged all around a pan allowing half of the planks to hang which are later on folded over the filling and which serves as the sealer for the mold. Pretty neat huh? And me who’s a sucker for layered concoctions (lasagna, crepe cake, tiramisu, timpano, etc.) I knew I’d be making it and I did and that was our Sunday dinner. I initially wanted to take a different route and roast the eggplant but I ended up with the frying pan somehow. Frying doesn’t take long but the process of draining the excess oil from the eggplants really took long. In hindsight, I could have saved time and a lot of paper towels had I followed my instinct. I had to make substitutions on some of the ingredients just because of I didn't have them but it did not change the outcome in any way. Heat the olive oil in a large saucepan. Add the garlic and onions and sauté until tender, 5 minutes. Add the tomatoes, red pepper flakes and some salt and black pepper and simmer for 20 minutes. Stir the basil leaves into the sauce at the end of simmering, if using. Grease the bottom and insides of the spring form pan with softened butter. Mix 1/4 cup of the breadcrumbs with 2 tablespoons of the Parmigiano cheese. Coat the inside of the pan well with the cheese mixture. Knock out any excess and discard. Heat 3 tablespoons of the oil in a large sauté pan over medium heat. Add the ground pork and sprinkle with salt and black pepper and sauté until cooked through. Add the garlic and cook until fragrant. Stir in the red wine and simmer until reduced by half, about 5 minutes. Add 4 cups of the red sauce and bring back to a simmer. Cook for another 5 minutes and season with salt and black pepper. Reserve the remaining red sauce for another use. Meanwhile, slice the eggplants lengthwise into 1/4-inch-thick planks. Heat 3 tablespoons oil in a large skillet over medium-high heat. Sprinkle the eggplant with salt and black pepper and fry in a single layer, working in batches, until golden brown, about 3 minutes per side. Repeat with the remaining eggplant, using 3 tablespoons of oil per batch. Remove from the oil and drain on a paper-towel-lined baking sheet. Combine the cooked pasta with the mozzarella and ragu in a large bowl. To assemble, line the bottom of the prepared springform pan with a single layer of eggplant, then line the sides with the eggplant planks vertically, allowing the excess to hang over the outside. Fill the inside of the lined pan with the pasta mixture, pressing down gently. 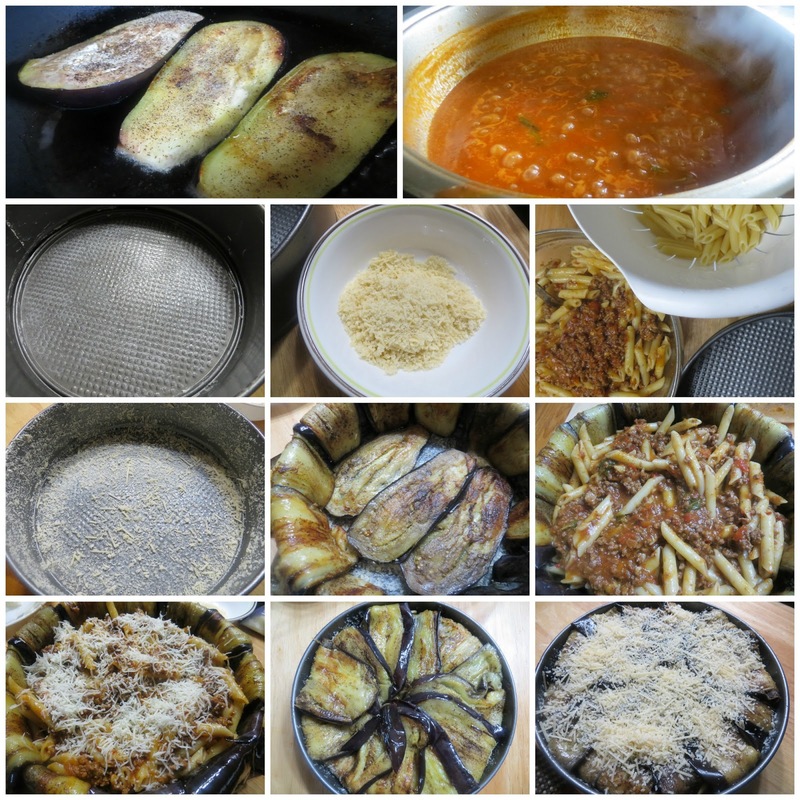 Fold the flaps of eggplant over the top of the pasta, using any remaining eggplant slices to cover the top. Cover with plastic and weigh it down with a plate. Refrigerate for a few hours and up to overnight. Sprinkle the top with the remaining Parmigiano and breadcrumbs. Cover the top loosely with foil, place on a baking sheet and bake for 30 minutes. Remove the foil and bake until bubbling and the top is golden brown, an additional 15 minutes. Let rest for 15 to 20 minutes and cool slightly before unmolding from the pan. Slice and serve. A slice of delicious heaven! The pasta is cooked a tad more al dente since it will be baked with the sauce so the process ends in the oven; the sauce is packed with flavors; the eggplant which is delicious to begin with and can very well stand on its own married perfectly with the filling and the Panko breadcrumb-grated Parm topping provided a nice crust so it was a truly successful endeavor and so deserving of an encore. Oh my goodness. I scrolled up three times before commenting because I can't stop looking at how delicious it is. Oh my goodness. YUM!